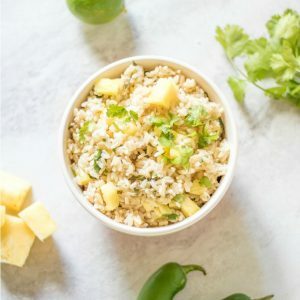 A copycat version of Chipotle's Cilantro Lime Rice with an added twist of fresh pineapple for extra flavor. Bring pineapple juice, water, jalapeno, garlic and salt to a boil. Add in rice and lower to simmer. Cover and simmer for 50 minutes, or until rice is tender and absorbed. Stir in zest and juice of lime and chopped cilantro. Serve on the side or as the bed to a main course. Place rice, pineapple juice, jalapeno, garlic and salt into your inner pot of your pressure cooker. Add in 1/2 cup water instead of 1 cup water--you need less liquid in a pressure cooker for cooking rice, because no moisture is evaporated. Set your pressure cooker to cook on high for 35 minutes for brown rice or 3 minutes on high for white or jasmine rice. Let pressure decrease naturally for 10-15 minutes and then do a quick release. Remove jalapeno and garlic cloves and stir in lime zest, lime juice, and cilantro into your rice and serve.